I fully believe that GDPR is a massive opportunity for marketers, and it shouldn't be seen as a negative impact. I've seen some organizations, they've lost more than 50% of their email marketing database because they couldn't prove consent. Email is a top-performing digital channel, it generally doesn't get the right attribution, so it probably outperforms way more than we actually realize. Think about putting yourself in the shoes of the customers. What are the key questions and information that you would want to know before you hand your information over? Tell your customers how you use data. Why you want to use it. And be really open and transparent about that. Every channel needs a strategy, and email marketing is no different to that. There should be a value exchange. The customer's going to buy your product because you solve a need or a want that customer has. And the same with the email. To develop an email strategy assess both the internal environments and external environments. And then from all of that, you can start to see where opportunities are. 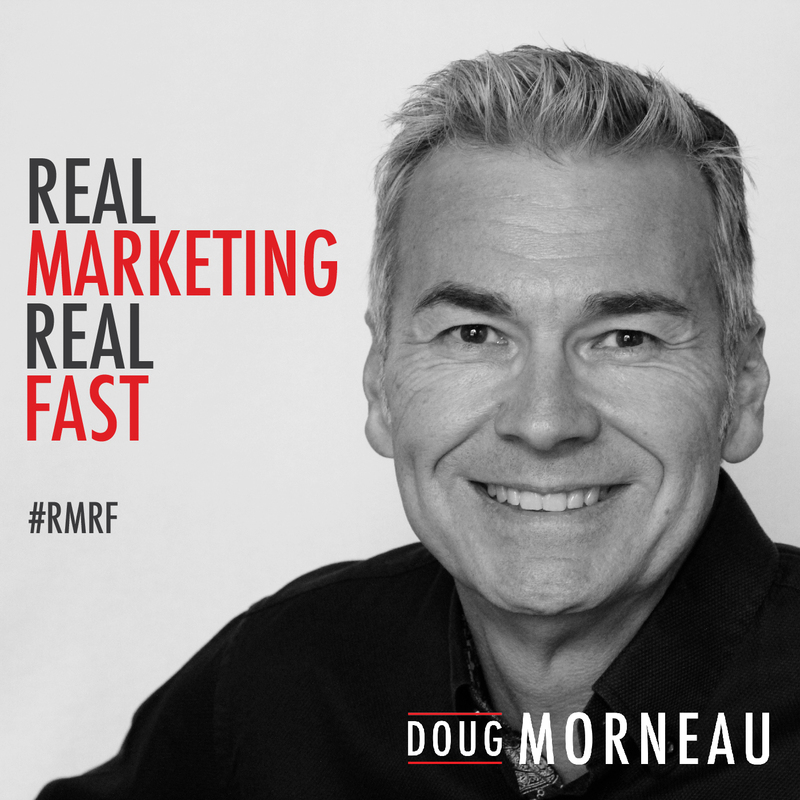 Doug: Well, welcome back listeners to another episode of Real Marketing Real Fast. Today I've got in studio, I've got a friend of mine joining me from the U.K. I've got Jenna Tiffany. And she is an expert in all things strategy and marketing, and especially in email. I think you'll enjoy today's episode as we talk about the new legislation that's come in recently with GDPR. What's happening with the new legislation in California. And she's going to share with you some tips of how you can take advantage of these changing landscapes and rules around marketing and connecting with your customers. And she'll share with you, some of her clients that have implemented these strategies, they've had massive wins. We're also going to cover off some new topics of how you can increase your revenue by five times. So, if that's something that you're interested in, then I would say sit back, take some notes, and enjoy the episode. Doug: So, just a bit better introduction for Jenna. Jenna is the founder and the strategy director at a company called Let's Talk Strategy. She provides strategic consulting services across the digital marketing mix, and she's also a chartered member of the IDM, with over 10 years experience in both the business to business and business to consumer marketing. She's consulted with some really large brands such as Shell, Hilton, Whirl, Duty-Free, just to name a few. Doug: I follow her on social media and I see her out speaking constantly around the world. So, doing that she's been recognized as an expert in her field. She is elected and served on the DMA UK Email Marketing Council, as well as she's the chair of the email best practice hub that's helping to shape the industry's best practices. And she's involved in the latest research. She's also a marketing tutor. She's teaching CIM courses, as well as a competent public speaker. And most recently she was just nominated in added to the list of the top 100 female marketers around the world to follow. Doug: So, with that said, I'd like to turn it over to Jena and welcome you to the Real Marketing Real Fast Podcast today. Doug: Well hey Jenna, I'm super excited to have on the Real Marketing Podcast today. Thanks so much for taking time out of your day to share with our audience. Jenna: Thank you so much for inviting me back. It's great to be back a second time on your show. Doug: Well I mean, yeah you just shared with me just a minute ago on Woman's Day, that you received acclamation of top 100 women and marketers to follow. So, congratulations. Jenna: Yeah. Thank you very much. It was a bit of a surprise, a brilliant honor. And listed alongside some amazing female marketers I really aspire to. So, that was a really great day for me. Doug : Well, since the last time we talked, obviously there's lots that's changed as we're seeing the GDPR rollout and the impact of that on business, and now looking at the U.S. market, looking at what's happening with California starting down that road, and talking about the article that I just saw you publish recently, and that was Why Does Email Marketing Need a Strategy? So, do you want to start off and just kind of give us an overview of what some of the impact has been for companies that embrace GDPR when it came in? And maybe that can point our listeners to what opportunities might come in the U.S.? And the impact of the companies that didn't follow the information you shared with me was pretty devastating, so. Doug: Yeah, I'll just turn it over to you. Jenna: Yeah, sure. So, GDPR I know is sometimes a bit of, an eye roll kind of happens when you talk about that for letter word. It's a bit of a, we've all got a bit of a GDPR hangover particularly in the U.K., I think. But yeah, I mean organizations that really tackled GDPR, they took a step back. They did this in advance. Some organizations were planning a year before sending their campaigns to their customers if they thought that they needed consent if that's what they determined. Six months or more in advance, not two, three days, the week before, the day of GDPR. And those organizations that really planned ahead, they took a step back and assessed it from okay, what are the opportunities of GDPR? So, I fully believe that GDPR is a massive opportunity for marketers, and it shouldn't be seen as a negative impact. Jenna: I know we were chatting earlier and for me, it really sets the foundation of what the expectation will be with customers moving forward, particularly for marketers, but also in that transparency piece. So, being really open and transparent about how you are collecting, storing and why you want to collect and store that data and what you will do with it. So organizations that really took that from a positive perspective, looked at it strategically, had a full plan in place, not just necessarily focusing on email, but actually an entire organization. I worked with and consulted with a huge international [inaudible 00:04:58] company, and their whole approach was to put the experience in the center, and to look at it from not only the digital marketing channels and the marketing channels, but also to look at it from the front of house. Okay, what things do we need to be looking at changing here? What language should we be using? How can we make this better or our customers, not necessarily better for us as a business? Because there can be a little bit of pain to include those changes. Jenna: So, for organizations that didn't do this, and I've presented a lot about GDPR and I provided like a summary session in London a couple of months ago. And there were hundreds of organizations that really left it up until the week before GDPR. And the search volume for GDPR on Google in the U.K. was higher than searching for Beyonce the day before GDPR. This is incredible. It took two years to come into play, so it wasn't something that was, it kind of just landed on our doorstep. I understand that. There were very things that weren't confirmed right up until the last minute. But the general premises of the regulation didn't change. And organizations that didn't take it seriously or tried to ignore it or didn't think it would affect them or just didn't really take the time to have that strategy in place, I've seen some organizations, they've lost more than 50% of their email marketing database because they couldn't prove consent. They didn't get the legal advice or necessarily the correct legal advice. And so they've had to just remove those subscribers. And 50%, to some organizations, that's a huge amount of potential revenue that's been lost there from not having that strategy in place. Doug: Wow, that's huge. I mean, and when you told me that number, I went that's, you look at all the effort that as marketers we put into having good communications with our subscribers, and actually the money that we spend to attract people to trust us with their email and subscribe, and to lose half of it overnight is, with a two-year advance warning, this seems a bit ridiculous. Jenna: Yeah, and I think for probably a month or two months, email as a channel took a little bit of a hit because of that. And some organizations decided that it was too much effort to use email marketing now because of GDPR being in place. And for me, that's really disappointing because we all know as email marketers that email as a top-performing digital channel, it generally doesn't get the right attribution, so it probably outperforms way more than we actually realize. Even though it's consistently outperforming, it's probably a lot more. And I think there's just a real kind of display of organizations that can see the value. They treat that channel strategically like they would the SEO, the BBC, social media, and don't just look at it as a tactic. Jenna: Whereas the other organizations that maybe have been a little bit more hit because they haven't been as well prepared generally are looking to other channels to see if they can try and claw that back, and now I guess are probably a little bit more nervous about using their email data as a result. Doug: So, what advice would you give people looking at what's happening in the U.S.? Because I can certainly relate, living in Canada, I can certainly relate when [inaudible 00:08:54] came into people. The week before the law was enacted, my email box was just full of emails from people wanting me to reconfirm for my opt-in. Doug: Which was funny, because they did exactly what you said. People waited until the last minute and looking at the Canadian law, there wasn't a requirement that had me re-opt in. So, they got bad advice and they probably crushed their database by asking me to re-opt in because guess what? I didn't. Jenna: Yeah. And that in itself is a really interesting kind of topic and discussion point because a lot of organizations didn't even need to do that. A lot of organizations did that because they either left it too late and so they started to follow, like a herd of sheep, they started to follow everyone else. Jenna: My competitor's sending these emails, I feel like I now need to. Jenna: And when I was speaking to an organization who ended up having to take that approach, I asked them, “Okay, so why did you feel that you needed to do that, even though you as the marketer, the marketing team knew that you didn't need to do this?” And their answer was that they just could not win the battle with the legal team because there were just a couple of kind of gray areas in the GDPR and the legal team were not willing to take the risk. Jenna: And so, part of that comes to not being as overly prepared, and sometimes it takes a kind of an external view and review to kind of provide that support and backup. But if your back is already up against the wall, you've got a deadline like two days before, you're never going to win that argument. And there was quite a lot of conversation about this in the email industry because a lot of the communication that was then sent if it was re-consenting, or re-permissioning is what it's also called, tended to be written by the legal team. So, it's no longer a marketing email. It's no longer, these are all the benefits of why you should want to re-consent with us. These are all the benefits as to why we want to keep you as a subscriber. It was more from a legal standpoint, and we all know as marketers that talking like a lawyer in our advertising isn't going to work. Isn't going to engage those customers. Jenna: So, it was a kind of a real chicken and egg situation for a number of marketing teams. This all comes down to not having that plan in place, and everything ended up being just so late. That is very, very difficult then too, you don't have time to have that conversation with the legal team. Doug: So, looking at the heightened awareness of what's happening with companies storing your data, and you look at Facebook in the news and the trust level that's there, and people now reengaging. I mean I'm seeing a lot of excitement and a lot of people coming back to email with all the changes in Social. Doug: Where do you think the opportunity is for our listeners that are working in America looking that America's now looking to what's happening with GDPR, you see California starting to enact new laws. So where's the low-hanging fruit? So, you're a marketer, you're marketing in the U.S., you've seen what's happened in GDPR. We've just listened to you talk about what happened there. What should people be doing today to get prepared? Jenna: Yeah I think, yeah my top piece of advice is to think about putting yourself in the shoes of the customers. So, if you're about to subscribe to an organization to their email marketing or receive any marketing from them, and they want to collect data about you and find out more about you, what's the kind of key questions and information that you would want to know before you handed that over? Because that's what our customers are doing every single day. And I would also, also needs to be looked at from a, not only from a kind of in the customer's shoes but also thinking about how you can make that experience better regardless of what that legislation's saying. So we were talking earlier, I really think that this is going to set the expectation from customers, whether they're in Europe or not, even if an organization is based in the States, if their customers are in Europe, GDPR applies. Jenna: So, I really feel that this sets the expectation from a customer. And if you're able to take that now and set that as your new normal standards, so, “Okay, we're going to apply GDPR in our organizations. We're going to be really transparent. We're going to be really clear about the data we're collecting and how we're using it, and we're going to do that up front.” You're going to start to build some really, really good trust with your customers if you do that immediately without a kind of almost being forced by legislation to have to do that. Jenna: If you look like you really want to do that for your customers, I think that says a lot and it kind of goes back to what you're saying there about Facebook. The reason why that kind of has started to drop on Facebook. Their average engagement rates have dropped a lot, and I've written about that in the article that you mentioned. And the reason for that is because the trust has declined massively, both in Zuckerberg, but also on Facebook as a platform. Nobody really trusts what they're saying. So, I think if you're able to take away that question mark and able to instill that trust, I think you're going to have a much better relationship with your customers. Doug: So to your point, there is the opportunity for your marketers is to be proactive. Jenna: Exactly. This is what the opportunity is for customers. Put your head above the parapet as an organization, as marketers, and tell your customers how you use that data. Why you want to use it. And be really open and transparent about that. And then you have a competitive advantage against your competitors, and you'll really start to stand out in the marketplace. Doug: Well from a consumer point of view, so having a foot in each camp and being a marketer, I, like you said, we've been aware for a long time the data that is available to use for marketing. But from a consumer point of view, I don't mind having advertising directed towards me that's based on my preferences. Because for me, it's a filter so I get less irrelevant offers and I get more stuff that I'm interested in. So, if I'm interested in golf or I'm interested in travel or I'm interested in fill in the blank, I'm happy to get those offers. But I'm less interested to get offers for things that I don't follow. Jenna: Yeah. Well, that's your, that's how you see the benefit to be from giving that data, I think that's the key piece from all of this, to market the benefit of what you're doing to the customer. So, them providing their email address, with them providing the date of birth, for example, these are all the things we're going to be able to do, we're going to be able to give you. And then why would a customer not want to give you that? Jenna: It's really interesting with the whole Facebook scenario because I mean, as we were talking earlier, the industry wasn't really as surprised, I don't think as consumers were in terms of the amount of data that Facebook has access to in terms of being able to profile and target an audience. But consumers had literally no idea what service say to them. It's like, “Oh my God. You know all this information about me. How's this even possible?” And we as marketers have known that that has been the norm for two, if not three years. I don't think the transparency has been known. And so as a result, across marketing, there is a little bit of a lack of trust in marketers. Jenna: And this goes back to what we were just saying there. This is where you really need to be proactive and start re-instilling that because that's kind of number one. That's the number one concern is either that their data's going to be hacked. There's a security issue. Or you're not going to use it how you said you were going to use it in the first place. Doug: Sure, fair enough. Or are you going to sell the data or do something else with it the data, as you said? Doug: That I haven't given you permission to. So, let's move on to a more fun topic, I mean maybe this isn't a nice way to say it, but a more fun topic. Jenna: I like the topic. Doug: I know you like the topic. But in terms of, and so I understand what you're saying, and it makes sense that here's an opportunity for marketers too, I mean it's also, the other way of thinking of it is its a way for marketers to get in front of their customers without asking them to buy something. Doug: So, could we shift to something that I know you're super passionate about and that is the strategy? Jenna: Mm-hmm (affirmative), of course. I love talking about strategy. Doug: You like it so much it's in your name. Jenna: It is. Not my official name, my company name. Doug: Your company name. Yes. Yeah, I have to look at your passport to see if it's your new middle name. So, let me ask the question that you've answered. Why does email marketing need a strategy? Jenna: Yeah. So, every channel needs a strategy, and email marketing is no different to that. I think the challenge with email is the mindset in that it's come from a very tactical place, and hasn't necessarily needed to be as strategic until probably two to three years ago. And now with GDPR it definitely needs to be strategic, which is a huge benefit to the email channel. But it needs a strategy because you need to be able to identify what's your objectives. What exactly are you trying to achieve? I'm still astonished every single day, and I've been in strategy and marketing for over 10 years, that when I ask a client, “Okay, so this is all great. The campaign that you've built and everything. It looks great. But what exactly is the objective of sending this email campaign?” And sometimes, more than nine out of 10 times, the client is unable to answer that question or they haven't really defined it, or they haven't really thought about it. They just felt that they needed to get an email campaign out. Jenna: And I understand the pressures, particularly in some industries where it's very fast-paced. It's very ad hoc. You need to be able to react. And email is generally the channel that can be used to do that. But you still need to have an overall objective of what you're trying to achieve. And the reason why that is so important is that that will help the business to achieve its goal. If an email hasn't got a clear objective, a clear target, a clear goal in mind then it will not be helping the business to achieve its overall business goal. And then that makes the whole conversation when it comes to budgets and looking at performance really, really different to be able to see whether or not a campaign worked, whether or not the strategy was successful, how much it's actually given back to the business. Jenna: Because without being able to define that, you've got no idea what you're measuring and what you're trying to achieve with the channel. 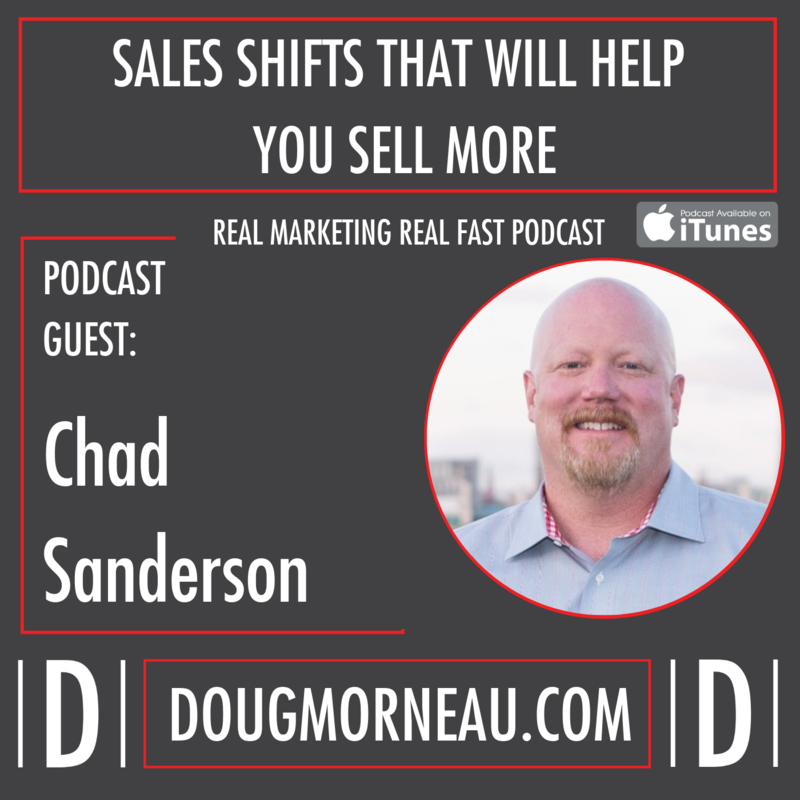 Doug: Well, and from my perspective, because the type of work that I do is most people are pushing the button, the send button, and their expectation is that the sales dial will move. Doug: Which is fair, right? I mean, we need to have sales to operate our business. But you obviously can't communicate with people every day with sales, well, at least in my opinion. You can't commit to a sales attitude. So to your point, a strategy might be branding, top of mind, education, building thought leadership as part of the strategy all mixed with the opportunity to sell or ask your clients to buy or buy more. Jenna: Yeah, exactly. Because you'd have potentially different customer journeys all focused towards a different goal based on what you've just said there. Because you can't, as much as we'd like to, you can't just keep sending an email every day and expecting to achieve a sales target every single day. Some very limited organizations would be able to achieve that. And you want your customer to come back, and if you're constantly sending the same message, “Please buy our product, please buy our product, please buy our product,” then that customer's not going to want to keep opening your email because they've already seen the message. They know you're going to say, “It's very predictable. Variety is the spice of life.” And it's the same for the email channel. Everything can get very stagnant if you don't have that variety in place. Doug: Well, I think some of the marketers are not super creative because they go from, “Please buy my stuff,” to, “Hey, let me introduce you to my friend. Please buy his stuff because I have an affiliate link.” So, it's a different offer, my spice of life. Here's a different sales offer from my buddy. Jenna: Yeah. There's kind of, this goes back to putting that customer in the center again. Thinking about why is the customer, what do they come to us for? What are they expecting from us? What can we give them? What's the value? What can we give the customer that's going to be useful to drive that value piece? Because all of it should be a value exchange. The customer's going to buy your product because you either solve a need or a want that that customer has. And the same with the email. If you want a customer to open your email, okay, what is the customer going to get from opening the email from you today that they didn't get yesterday if you're sending it on a daily basis? And that's, yeah, I really, I just find it's really, really important to always try and take a step back and just review things with almost like a fresh sheet of paper. Just to have a look and think, okay, if I could do this differently, what would I have changed? Jenna: Because I think we are, we live in an increasingly fast-paced world. Things are changing all the time. It can be really difficult to just take that step back and just try and look at it with a fresh pair of eyes, a different day and think okay, let's just be a little bit critical here. Maybe we could have changed this and we could have done X, Y, and Z. And then you've got ideas for your next campaign and always continuously improving. 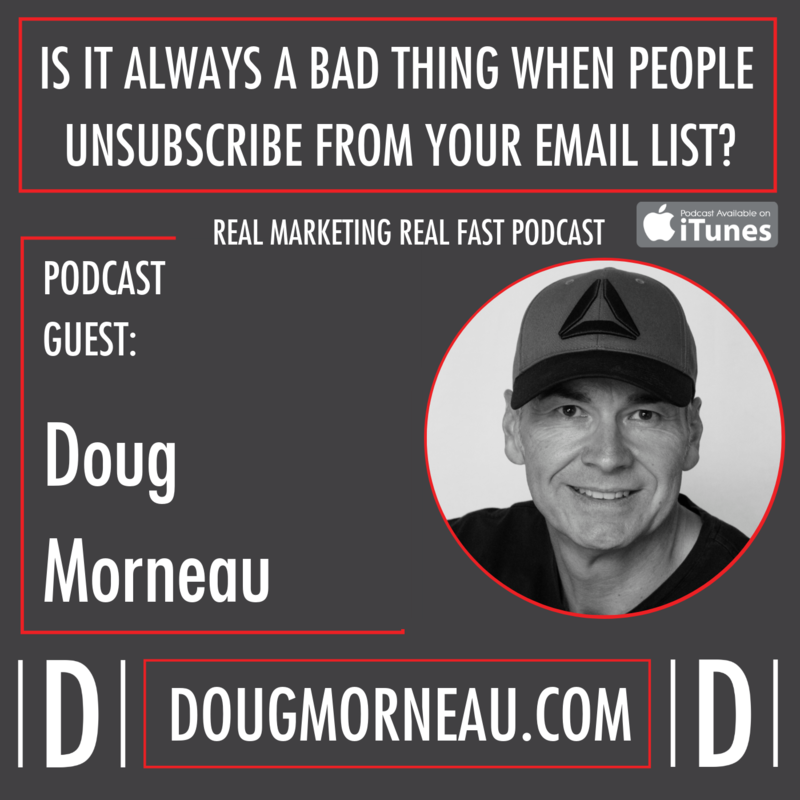 Doug: The way I think about some of the stuff that I do for my own business is if my subscriber opens the email, will they be happy? Will I have made their day better? Will I have added value to them in some way? And if the answer's no, then I'm sending the wrong content. Jenna: Yeah, that's a great way of looking at it. Doug: So, where's the starting point? So, it's great to say, “Hey, we should have a strategy. But what does that really look like to an organization that right now is just mailing their list once a week because they know they should? Jenna: Yeah. So, the first starting point would be to assess both the internal environments and the external environments, so I'll explain that. Say the internal environment is the organization itself. And there are some really good tools out there including a SWOT analysis, so your strengths, weaknesses, opportunities, and threats and using that for the email channel. So, it could be that our strength is that you have an email design team and so you're able to get really creative. But a weakness might be that it takes you six weeks to turn around and email. And believe me, I've worked with clients that it takes that long to send an email. So that would be a real weakness. Yeah. Jenna: And analyzing it from that perspective, but then also looking at it from an external perspective. So, there's a model called the PESTEL, and this looks at a variety of different factors including political, economic, technological, social. And in each of those, you would list in there, okay, these are all the things that are affecting our organization from outside. These are the things that we can't necessarily control but we need to be aware of because these are probably also impacting our customers. So, this could also include if you had higher unemployment rates and things like that, depending on the product and service that you're offering. That could have a huge impact on your organization. Jenna: And then from all of that you can start to see okay, these are where our opportunities are. These are the things that we need to be thinking about in terms of our customer or for our business. These are things we need to be able to combat. And then you start to get a bigger picture of what's happening for your organization that isn't just necessarily email-orientated. Email is going to have a place to fit in there to be more successful for your organization. And to combat all of these things. But being able to identify what those strengths are, what the weaknesses are means that you can start playing more to your strengths and the opportunities, and be very, very aware of what those weaknesses are and have a plan in place of how you might be able to combat them. Jenna: But if you can't combat them, just be very aware that, okay we've got these limitations, and this means that we can't do X, Y, and Z, but we could do this. And then you start to have a bit of a broader conversation. So that would be the first sign, to really analyze the situation of the organization and the email channel. Doug: And as a guideline, how when you're working with an organization to develop a strategy, how far out are you typically planning? Jenna: Oh, that really depends on the organization, their current situation, what they're wanting to achieve. Doug: What I'm wondering is are you saying, “Hey, let's look at a year out.” And then obviously all the political and economic things change all the time. But overall, this is our plan for the year. And then depending on what's happening globally or locally or regulatory, then we need to make some changes. But just at a high level, so. Jenna: Yeah. So the ideal scenario would be that you would plan out a year, and potentially your financial year. So, then you're able to set aside, okay, this is the amount of budget that we've got as well and that would really help with your planning. But it may be that the best thing to do would be to then review that either on a quarterly basis or on a monthly basis depending on how much activity that you're doing, and what your goals and targets are, to just check in, okay, are we looking like we're going to achieve this strategy? What's changed? Has something changed massively in the political world, for example, it's going to have a huge impact that we now need to start adjusting and tweaking the original plan that we had in place? Jenna: A strategy shouldn't be, a lot of people have an image of a strategy that it's like a huge 500-page book that goes in the drawer that no one ever sees. And that isn't the case at all. A strategy's there just to start setting your plan. It doesn't mean that it's going to get carved in stone and your name's going to be on it and your signature and you're bound to it by life. It can change and adjust. It's just a good starting place to set that foundation. Jenna: So yeah, I would recommend having a regular check-in of at least every quarter, if not every month. Doug: So it could be a couple of pages or the back of a napkin. But at least a starting point so when they work with you and you say, “So, why are you sending the email?” Now they have an answer. Jenna: Yeah, exactly. And once you've been able to analyze your situation and the environment that you're operating in, you can then start creating objectives. And it's really important that these are smart objectives, it's an analogy so that they are specific to what you're trying to achieve, they can be measured. Because if you have an objective that's just to increase sales, how do you measure how much you've increased by when, to who, what product? You need to start going quite granular in the detail of that so when you come to that measurement piece, you know exactly what you're looking for and it starts to help you on a day-to-day basis then because everybody's then very aligned to, “Okay, this is our goal. This is our objective. This is what we're sending. And this is how it's going to help us achieve that because it's going to do X, Y, and Z.
Doug: It's funny. I'm obviously, a podcast, you can't see me sitting back smiling, but I'm thinking, I mean, I had those conversations. And then one of the words I think people get tired of me saying is test. Jenna: Yeah, testing is a big part and always will be a big piece because what happens or what is successful for one organization doesn't necessarily mean it would be the same for another. And I know, I regularly have that conversation with clients as well, and I know it can be really frustrating. But the best thing is is that they're testing something specifically for their organization and whether it's a positive or negative outcome in terms of its performance, you've always got some earning from that. Which means as a business, you can only do better. Doug: Well, that's what I think. I mean you test and improve, and you've got your baseline. And the goal is hopefully every day you're just making small changes and you're moving that dial a little bit better day after day looking back at your history so you know where you've come from. Jenna: Yeah, exactly. And if you don't test, how do you know that you're getting the optimal performance for what you're doing if you haven't tested to see if there's more out there? Doug: Yeah I always, that's normally how I would sell that to somebody. It's like, you don't know how much money you're leaving on the table unless you're testing. You might think that this is working really well, but what if with a few tweaks, we changed this and it makes a two percent difference on this metric? What does that look like? Jenna: Yeah, exactly. [inaudible 00:30:52] or anything, but. No, exactly. I completely agree. Doug: So, looking at some of the other stuff that you've published and just to move into the what are you most excited about, what are you excited about in this base that we're in? Jenna: Yeah. I am so excited about artificial intelligence. I think we may have spoken about this the last time. But for me, I know it has a little it of a negative connotation in that people think it's going to take away your jobs and you're potentially sat next to a robot, and all of this. But for me, that isn't the risk of this. I feel that it will really enhance the marketer's job. And I've already seen it start to do this for some organizations, particularly in the email space. So, there's some brilliant artificial intelligence technology out there that will automate and create intelligent subject lines. And I've worked with a number of organizations that have tested this. So, they've tested using it and being able to see if it will drive better results. So, will it drive better opens? But will it also drive better click-through rate and revenue? Because okay, you could get more opens, but it doesn't necessarily mean that the content inside related to the subject line. And so then it's kind of like a false positive. Jenna: And so for me, it's just, I think it's just incredible. I think it will really enhance our jobs. It will allow us to do more of the strategic thinking, more of the creative element that we all want to be doing, and be able to analyze all of this data that we have access to but don't necessarily have the time to analyze. And so for me I just, I'm really excited about the technology. Doug: Well, and for listeners that aren't excited about technology, I'll just go back to just the very crude approach is five times revenue. If that doesn't pique your interest to “Hey, maybe I should check this out,” I don't know what will. Jenna: Yeah. It was just astounding. And that is with a couple of clients that have achieved those results. So, and that isn't just U.K. this is also U.S. so, it's the U.S. market. It's international. An organization that I worked with, they were looking to test this. They didn't really believe in the technology that really couldn't achieve better results I'm not already getting? Let's just try it. And they had a six-month trial originally and they stopped it short within three months because the results were already astronomical and then went worldwide. So, it's just incredible and I am really honored to have been able to witness that really early on in its development and be involved in that. Jenna: And so for me, I just I see it's a real positive and I see a huge negative element in that it's going to take jobs. But it's a lot of research out there that tells us all that it's actually going to produce more jobs than what it takes away. And I just think it's only a good thing I was able to really hone in on that data that we're currently struggling to analyze because we can't do it at the scale of the machine. And the machine is still going to need our human input because it can't operate on its own. It needs to be told what to do. When to send. Things, words that you might not want to include because it's not part of your brand voice, and so on. So, for me it's just a really interesting space. Doug: Yeah, I'm super excited. I've had a couple of guests I've interviewed recently in the AI space, and one, in particular, we talked about what's kind of happening with SEO and how SEO has changed to the point that it's no longer keywords and all the stuff that we used to think for ranking. A lot of it now is coming down to user engagement, which has been in the email space for a long time. If people aren't opening and clicking and responding to your emails, I mean it affects your deliverability and all the other reputation. But online now, so AI is in that space, and also in CRM. And I'm excited because I think as a marketer to sell the benefit, I guess I can't help but do that. Because again, it's I'm hopefully speaking a better language to my customers that's more relevant and again, the offers and conversations that we're having are more suited to what they want. Jenna: Yeah, and being able to go back to what you said at the beginning about personalization. It's personalizing on another level because it's able to learn they use an individual do or do not like. And so it starts become personalization at scale that we're already trying and striving to achieve as marketers. Doug: Yeah. Although I think it's going to have a, it may have some impact in terms of people who design ads. I mean, I talked to a company in Toronto and they're doing Facebook ads that at scale that are generated by AI. So, the days of having your graphics department create one ad and then after the strategy session is done and say, “Hey, this is the direction we're going to go,” and then running one ad. The same though, we're going to create 500 ads and we're going to run them and we're going to see which ones convert the highest, and that'll be the new norm. Jenna: Yeah, and then you'll probably have a lot more marketers that are more kind of analyst or like managing almost the campaign, but managing the artificial intelligence and machine to go down the, you want to take it once it's presented those results back. And that's probably how the marketer's role will change slightly in that type of context. Jenna: Yeah. I haven't had a really, I was just trying to think about an odd question that I've had. I don't think I've had a really, really odd question. Oh actually, one question I did get asked when I was in Romania a month ago was, and I'm not sure it was really classed as an odd one, but it's a very thought-provoking question. What do we think the job role titles will be for marketers in the future if we're all using AI? So, will we still be a website manager, an email campaign manager, and so on? Do we think that AI will have an impact in terms of what our job roles and description and titles will be? Jenna: And that's quite interesting. So not really, no one's really asked me that before. So, it was quite a thought-provoking question that I don't have the answer to. And I'm still thinking about like oh, I'm not quite sure. Doug: Well, that's what I was waiting for. I was waiting for you to tell us that here's the magic formula. Send three times a week at this time. Jenna: If I had that magic formula, I'd be on a beach in Barbados right now. And I can assure you, I am not. Doug: Well, I just had my thinking expanded because I had a conversation with Della [inaudible 00:39:50] last week. Jenna: Yeah, I can imagine. Jenna: Exactly. And that is completely my response to that as well. But also looking at past performance and analyzing it by segment. You have to do some really ground analysis into that as well to see if there is a particular time of day. Because I've worked with some organizations, and it's amazing that they are sending an email, it's like a membership organization, so slightly different where you had to be a member to receive their emails. But they were sending an email midweek. And when we looked at the chart over a six-month period and we looked at the data the week of when it was being opened and clicked on, customers were receiving it on a Wednesday, but more customers were actually opening it on a Saturday than when it was actually sent. And I've never seen this before. I've never seen this repeated with another organization where a customer wanted that email so much that they saved it and waited until a weekend when they had more time to read it. Doug: That's amazing. The content must be great. Jenna: I know. So, they're definitely not sending it on the right day based on that. Or they are. And they test it, do we even change that to a setting on a Saturday. So, but yeah, there is no magic formula. I wish there was, but there just isn't. And I'm amazed I still get asked that question. 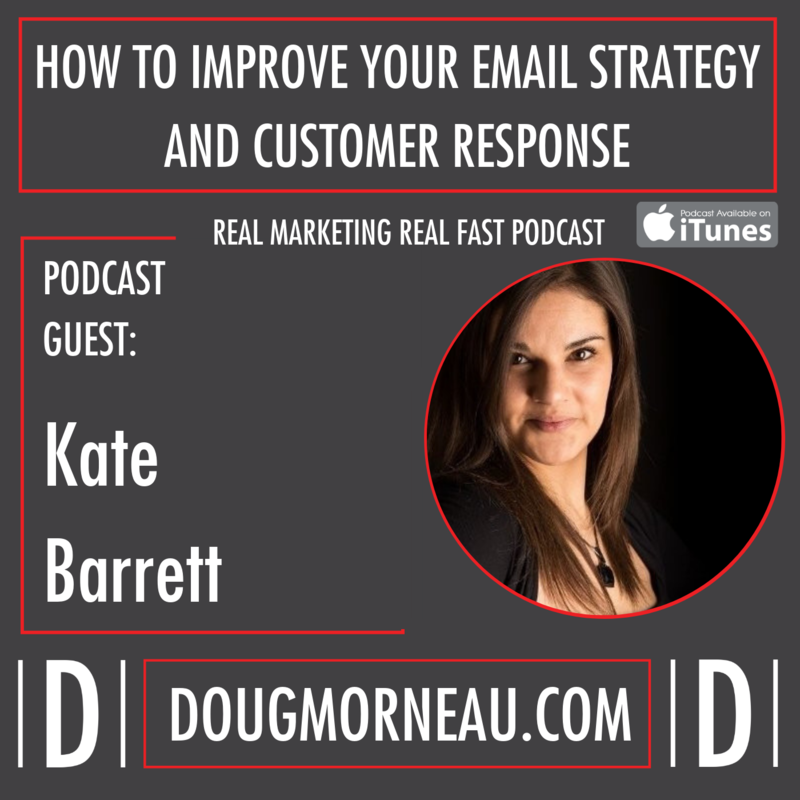 Doug: Well, with today's tools in terms of sending email, I mean there's email tools that do predictive sending so they know when your subscribers open. So, there are lots of tools that make it very easy to figure that out. Jenna: Yeah. And to be able to analyze that, dig deeper into that, and potentially look at what's happening in the industry. But that needs to be taken with a pinch of salt. I do know that some brands will really just look at, okay, in this industry, this time of the day, his day of the week, we should be sending then and yeah, it's quite a dangerous approach if you're not testing it. Doug: There we go. See, I didn't say it that time. Jenna said testing. Jenna: Yeah. And I'm sure [inaudible 00:42:11] said that many times as well. Doug: Yeah. Just a few. So, any parting thoughts or wisdom you want to leave with our listeners today? Jenna: Yeah. I suppose just going back to that question I guess about what's the one question I still keep getting asked. I guess the one thing I'm really still surprised to see is the misinterpretation of what a strategy is in comparison to tactics. So, a lot of organizations have tactics, so like using channels and email, social media and so on. And a lot of people will then class that as a strategy. And that isn't a strategy. Jenna: And I'll just break this down really simply and this will be my closing thought. A strategy is about determining the who, what and why of what you're doing. And the tactics is how you're going to do it. So, the two work together. They need to work together because if you just had a strategy and you didn't use any tactics to implement, you wouldn't have an active campaign. But if you just have the tactics and you don't have the goal, then you don't really know what you're achieving based on how hat we were talking about earlier. So, really it is thinking about okay, why are we doing what we're doing? What do we need to do and when do we need to do it for the strategy? And the tactics is how do we then implement that? Jenna: And it's as simple as that. It's not 100-page document as we've spoken about. Jenna: That is your strategy and that is your tactics. Doug: Excellent. Hey, well thanks so much. It was great to chat and catch up again today. Jenna: Yeah. No, thanks so much for having me. It's always a pleasure. Doug: So, there we go listeners. I hope you've got some new information and I hope that through this conversation with Jenna that she's encouraged you to be bold and take leadership with what's happening with privacy GDPR, what's happening in California. What's probably going to roll out across the U.S. and just continue to go. So take advantage of that. I would suggest that you follow up and follow her on social media and check on her website. So Jenna, where can people find you? Jenna: Yeah. So, I am on Twitter. So @jennatiffany. I also run my own consultancy called Let's Talk Strategy, so that's letstalkstrategy.co.uk. And also feel free to email me, so it's jenna@letstalkstrategy.co.uk. Doug: There we go. So hey, thanks again, Jenna. Really appreciate taking time. I'll be checking you out again on Instagram watching you travel around the world and share your knowledge with marketers and brands all over the place. So, thanks again. Thanks for tuning in, listeners. Jenna: Oh, thank you very much, nice speaking to you. Doug: We look forward to serving you on our next episode. Thanks a lot.